The market produces so many customizable guns to give firearm enthusiasts more to think about. Some changes not only enhance a gun’s functionality but also gives it a badass look compared to how it came out of the box. If you’re fond of accessorizing your firearm, then go ahead and do so to your heart’s content. Feel free to customize your own handgun or any firearm as you desire! Just keep in mind that because there is an accessory for a gun, it doesn’t mean you have to bolt it on. I prefer just having upgraded iron sights or an EOTech and a light on an AR-15. These customizable guns are known for having numerous aftermarket and replaceable parts like triggers, sights, stocks, you name it! The one shown here has a custom fore-end, heat shield, and an ATI stock. This shotgun is ultra customizable and a very popular choice as a tactical shotgun for home defense. Do a simple Google search and you will find hundreds of customized Mossbergs and the different accessories you can get for it. Shot shell Holder is composed such as that it can be easily installed to your shotgun as all mounting screws are included. 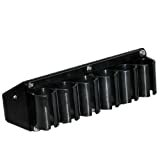 Tactical Shell Carrier is compatible for various shotguns mainly For Mossberg 500/590/590 DA. 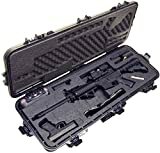 Quality of shotgun shell case is assured and maintained up to a certain level and when compared to market our Cytac shotgun carrier will beat them all. This Remington 870 has the Warhammer Rail that goes all the way from one end to the other and one on each side. It has a flashlight, laser, red dot sight with backup foldable front sights, and an ATI stock. All the accessories on these shotguns are from different manufacturers, which shows how big the aftermarket accessories industry really is. This handgun comes from the factory with a lot of cool, tricked-out accessories already on it. And yet, the 1911 gun is one of the most customizable handguns in the world. Anyone of your gun enthusiast friends may have a custom 1911 or custom Glock of their own safekeeping. There are more people in the aftermarket 1911 gun parts industry than any other gun, including the AR-15. It is also one of the first guns to ever be customized with high night sights, beavertail grip safety, and forward cocking serrations. If you were to only have one gun in your arsenal, this would be it. This gun allows installation of folding stocks, collapsing stocks, barrel shrouds, sights, rails, etc. You can easily spend over $2,500 building out your 10-22 and still have many more options to accessorize the firearm. The AR-15 already comes with a collapsing stock out of the box. You have rails, charging handles, bipod, red dot sights, EOTechs, lights, lasers for an all-around choice of add-ons. In addition, most AR-15s come with a flat top upper ready for accessorizing. One accessory you want to have is the B.A.D. Lever, which allows you to drop your mag and close the bolt with one finger. It is unbelievable how many accessories you can equip this firearm with! The gun industry already makes a fortune from selling guns and ammunition. And now, they have opened up another avenue for business by introducing a wide range of customized guns. I personally feel like I’m a kid again, getting all pumped up with my new toy. Only this time, I’m dealing with the real thing. All these different options to customize a firearm is, indeed, a paradise for gun dudes out there! What customizations have you tried with your firearm? Share your ideas in the comments section below! Up Next: Bug Out Bags | Do Guns And Ammo Belong In Them!